Czigany World Fusion Dance Company is a Gypsy/Tribal Belly Dance company in southeast Michigan. Formed in 2003 and led by artistic director Krisztina, Czigany has quickly become well known for their unique dance style, professional performances, beautiful costuming and audience appeal. Our performance company consists of both professional and student dancers. 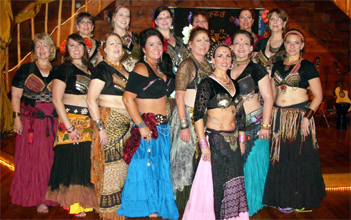 Czigany's dance style is rooted in Middle Eastern Dance (Belly Dance) and we perform both American Tribal Style® Belly Dance and a large variety of creative fusion dances. Czigany is available to perform at your next special event. Our family-oriented performances are upbeat, fun and interactive. We offer a large variety of performance/party packages to choose from including: belly dance lesson parties, gypsy style performances, theme parties, and special occasion performances. Our exciting shows include specialty dances with canes, baskets, fans, candles, and swords. Czigany World Fusion Dance Company's traveling Souk carries a wide variety of dance supplies and costuming. We also have several elaborate sets that include decorative backdrops and stage props available to transform any setting into a Mediterranean Oasis. For more information on booking Czigany for your event email or call Krisztina at 586.321.1731.